I have found that the best way to hold a carving in place on the work bench is to fasten the back of the profiled blank to a piece of quarter-inch hardwood plywood. I stumbled on this scheme after using several different means to secure the piece. 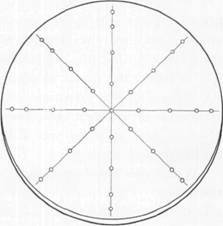 I would suggest a round piece, about 18 inches in diameter, laid out in pie-shaped sections by pencil and having holes drilled and countersunk at regular intervals along the pencilled lines. I fasten this plywood to the back of the carving with three screws, usually ¾ inch, No. 8 in size. Curiously enough, these three wood screws have never failed to hold the carving in place, no matter how much I work on the design. By having the plywood hold-down overlap the edges of the profiled piece, you have room to clamp the plywood to the edge of the bench with steel or cast iron clamps. Nominally I clamp the whole business to a corner. This lets me work on two sides of the piece at will. I seldom remove the carving from the back-up until I have the bosting completed. I use 5/8-inch or ¾-inch #8 steel wood screws to attach this hold-down to the back of the carving. Usually 3 screws are enough. Suggested diameter-18 inches, using ¼-inch hardwood plywood. The technical term for making the rough cuts is "'bosting." The purpose of bosting out a carving is to eliminate all the surplus wood from the face of the piece. This process is best done with the larger gouges and chisels. The first step in the process is to outline all the detail that is later to be carved or modeled with the smaller tools by making the stopcuts. This is shown in Images 3 and 74. These stopcuts are made so that stock will not be removed from the high detail they outline. To make these cuts use variously shaped tools that approximate the outline of the detail that is to remain for further working. I prefer not to use any but straight toolsthat is, I find that the long, bent gouges are not suitable for this business of stopcutting; there is too much spring in the tool to drive properly and there is also the danger that you will break the tool. Which I have done when I first started carving. Reasonable care must be taken in bosting out to the stopcuts after the stock has been removed for the first quarter inch. Prior to that time, chisel out along the stopcuts carefully on the waste stock side.